https://sep.yimg.com/ay/yhst-33477391359232/blue-linckia-sea-star-linckia-laevigata-blue-linkia-9.jpgBlue Linckia Sea Star - Linckia laevigata - Blue Linkia Expert Only!!! Taxonomy: Blue Linckia Sea Star belongs to the Kingdom Animalia, Phylum Echinodermata, Class Stelleroidea, Order Valvatida, Family Ophidiasteridae, Genus Linckia and Species laevigata. 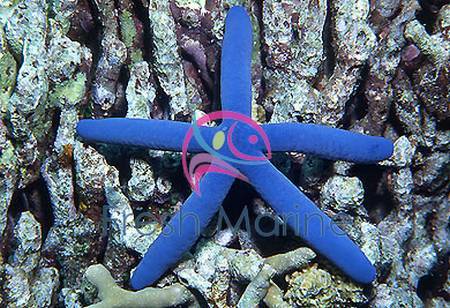 Scientific names: The scientific name of Blue Linckia Sea Star is Linckia laevigata. Other common names: Blue Linckia Sea Star is also commonly known as Blue Linkia, Blue Sea Star, Comet Sea Star and Blue Starfish. Origin or natural range: Linckia laevigata originates from Fiji. Size: Blue Linckia Sea Star may grow up to a size of around twelve inches. Color: Linckia laevigata occurs in blue color with purple or red colored spots. Aggression: Blue Linckia Sea Star is non-aggressive towards the marine aquarium invertebrates. Compatibility: Linckia laevigata is reef compatible. Venom status: Blue Linckia Sea Star is non-poisonous in nature. In its natural habitat, Linckia laevigata is found solitarily on reef edges or on reef surfaces getting direct sunlight. Blue Linckia Sea Star can generate a new starfish from every fragmented part of its body. Hardiness: Linckia laevigata is not very Hardy. Tank type: To host Blue Linckia Sea Star, you should have at least six months old Reef Type Marine Aquarium. Keep ample rocks, rock caves, sand, gravel or coral rubble for Linckia laevigata to hide in and search for food on, in your reef tank. You can keep Blue Linckia Sea Star with other non-aggressive starfish and other marine fish. Illumination: Blue Linckia Sea Star requires adequate lighting in the marine aquarium hosting it. Acclimation: Slowly acclimate Linckia laevigata to your reef tank�s environment through Slow Drip Acclimation Method. The slow acclimation process generally takes a minimum time period of two hours. The young ones, called juveniles, of Blue Linckia Sea Star mostly hide away behind rocks, in rock caves and or on rocky overhangs in the marine aquarium. Adult Linckia laevigata anchors its two to three arms to rocks or aquarium glass leaving its rest of the one or two arms waving with the water current to catch its food. The power of generating new starfish through fragmentation becomes nearly nil in the captive environment. Diet: Blue Linckia Sea Star is Herbivorous in feeding habit. Food content: Linckia laevigata eats Film Algae. Benefits: Blue Linckia Sea Star is a Film Algae eater and therefore, keeps your reef tank free of Film Algae infestation. Blue Linckia Sea Star is difficult to maintain. Copper and Nitrates in any form in your marine aquarium may prove lethal for Linckia laevigata. Sudden fluctuations in the Oxygen level, temperature, specific gravity and/or pH of water in your marine aquarium may prove dangerous for Blue Linckia Sea Star therein. An exposure of Linckia laevigata to the air may prove fatal for it. Therefore, be very careful to keep Blue Linckia Sea Star under water all the while you are handling it. Regularly check and remove the parasitic snail, Thyca crystalline, on the body surface of Blue Linckia Sea Star.